For many, the topper to any holiday celebration is the dessert, and Chanukah in particular calls for something warm and sweet to end the holiday meal. 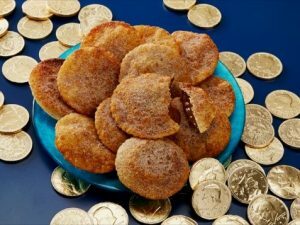 The American Association of Orthodontists (AAO) is sharing its Chanukah Gelt Wonton recipe, which is a tasty, easy-to-prepare solution that is sure to be a holiday hit for those in orthodontic treatment and those who are not. Lay out 12 of the wonton wrappers on a clean work surface. Unwrap the chocolate coins and place one in the center of each wonton wrapper. Lightly brush the edges of each wonton wrapper with water and place another wonton wrapper on top, pressing the edges to seal in the chocolate coin. Place butter and canola oil into a large frying pan and melt on medium heat. Fry each wonton for 2-3 minutes per side. Place the cinnamon sugar in a shallow bowl and dip both sides of the wonton until coated. Let cool slightly and serve warm or at room temperature.